Note that if the user wants to buy 12V power adapter by themselves, its output current is at least 3.5A, and the polarity must be center positive. Note that when you run its driver setup program, you will be prompted to install camera driver, network card driver, and FTDI Serial port driver. 4. 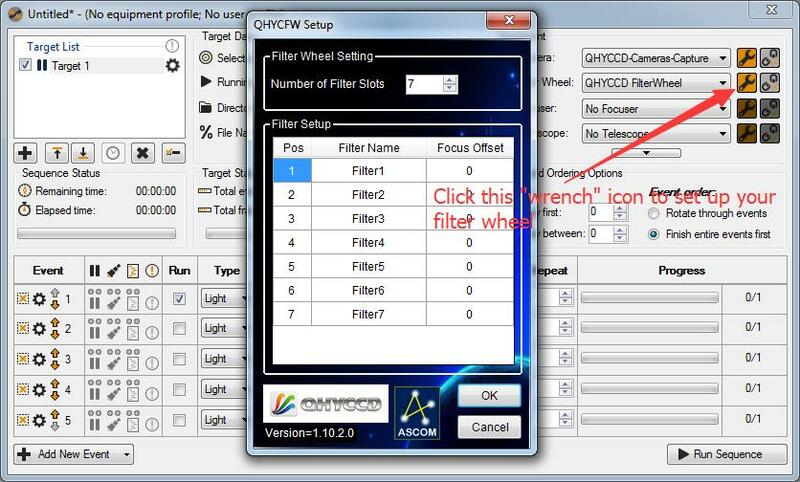 Download and install the ASCOM Filters Plug for the built-in filter wheel. 5. 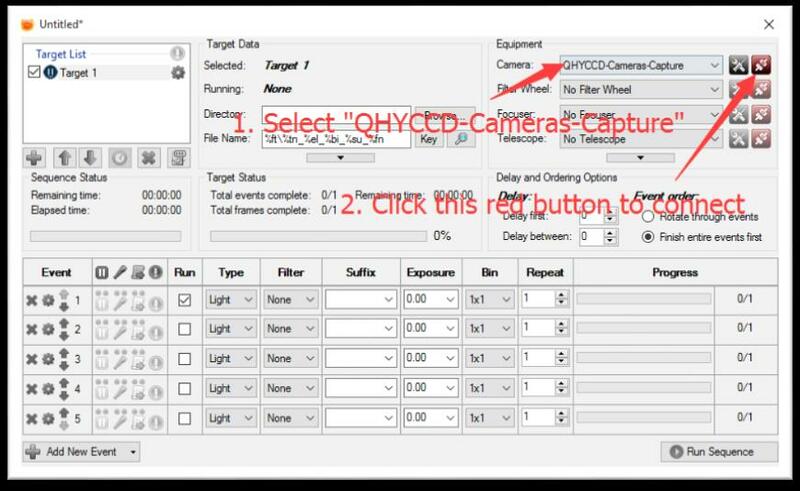 QHY90A camera uses EZCAP_QT as the default capture software. Please download and install EZCAP_QT. 6. Connect QHY90A to your PC with USB2.0 cable. Connect your QHY90A to 12V power supply. Make sure 12V power supply is always connected when you use QHY90A. It is also highly recommended that to use the 12V extension cable because it has self-locking function. 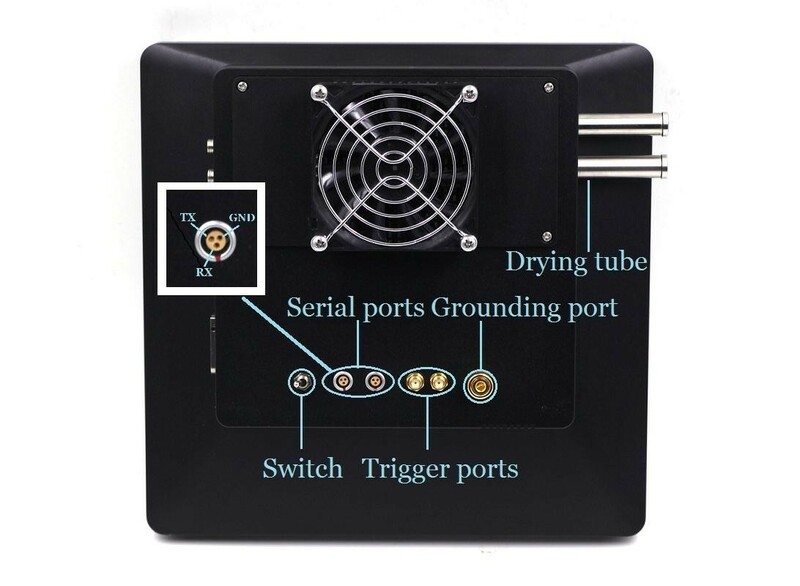 Note that there are two power ports on QHY90A, and these two ports are connected in parallel, so you can either one of these two as power input port and use the other one as a power output port for other devices that need 12V power supply. Turn the switch on. For the first time the system will find a new device and search the driver. You can keep skipping the online searching by clicking "Skip obtaining driver software from Windows Update" and the computer will find the drivers. After installation is complete successfully, you can find the device in the device manager as shown in the picture below. 7. QHYCCD has developed a software named UpdateCheck that can check if the drivers installed on your computer are the latest versions as well as update the drivers if needed. If the status of some driver is “Need Update”, you can directly download its update package in this software freeing you from the inconvenience of looking for and downloading it from our website. Take QHY367C for example, you can see the drivers we need are the latest versions and don’t need to be updated as shown in the following picture. Note that after you downloading and installing the new drivers by using this software, be sure to pull the USB cable out and then plug it in to enable the new drivers. 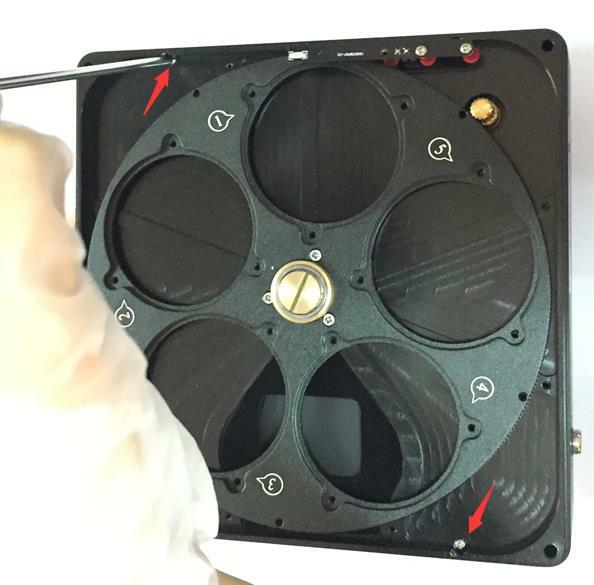 QHY90A contains a built-in 7-Hole 36mm filter wheel. Please follow the instructions below to install filters for it. 1. Use the screwdriver included in the box to remove the screws on the topside of the camera. 2. You can see the filter wheel after opening the top cap. You can install 50mm filters and fix them with screws and washers. Please make sure that filters and screws used for fixing the filters do not touch the top cap and photoelectric position detector. 3. 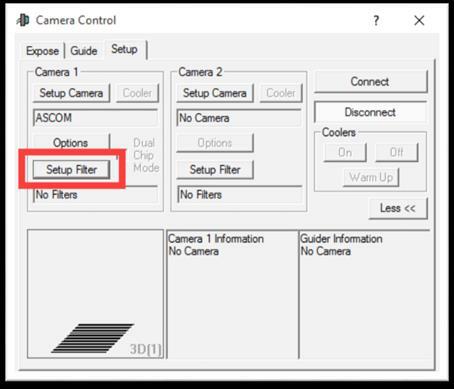 After you've finished installing the filters, you can turn on the camera and connect the camera to your PC with USB cable to make sure the filter wheel can work properly. 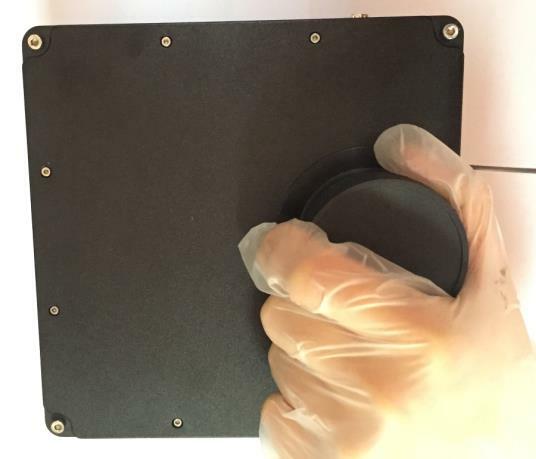 Note that the filter wheel use photoelectric position detector to determine the position of the filter, so make sure you are not exposing the filter wheel to strong light when you are testing if it can work properly, otherwise the strong light may affect the photoelectric position detector. 4. Install the top cap. Now we have finished installing filters, we are going to introduce how to use QHY90A in EZCAP_QT, MAXIMDL, and Sequence Generator Pro. EZCAP_QT is the software developed by QHYCCD. 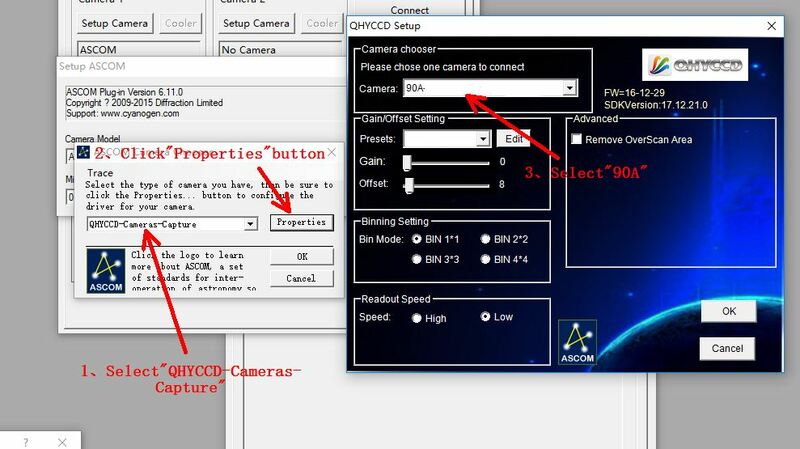 This software has the basic capture function for QHYCCD deep sky cameras. 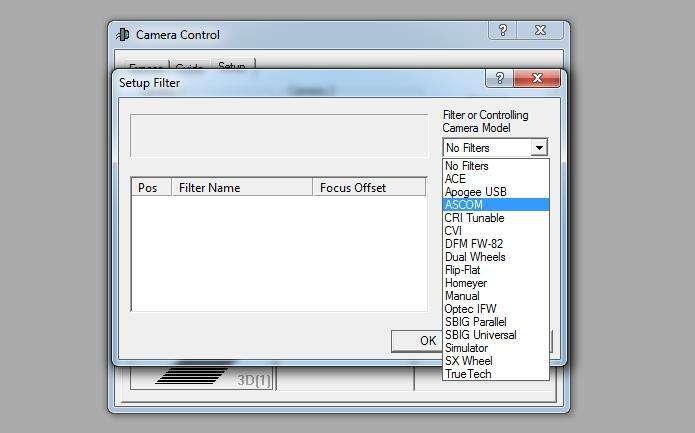 You can use this QHY90A camera with its built-in filter wheel in this software. 2. Connect your QHY90A to 12V power supply. Connect your QHY90A to your computer with USB2.0 cable. 3. Run EZCAP_QT. 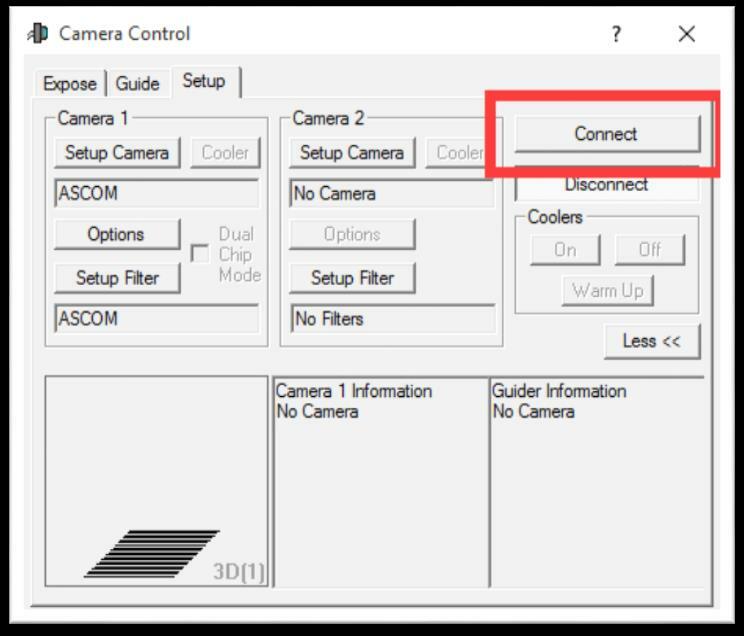 Select "Connect" in Menu->Camera. If the camera is successfully connected. 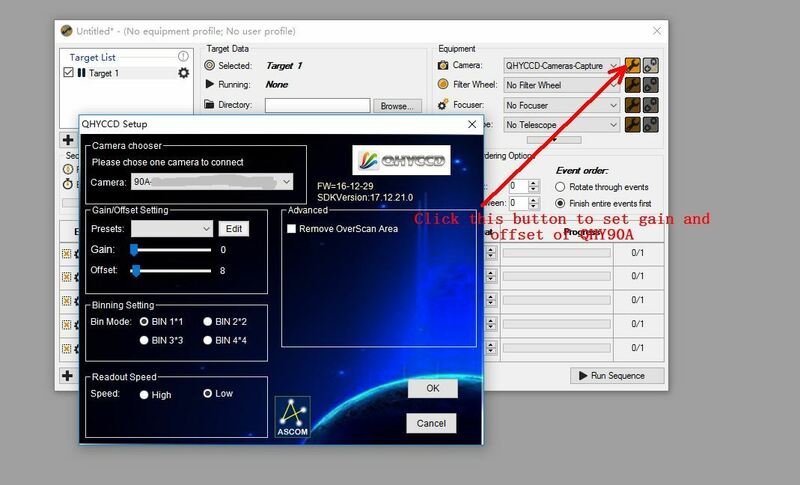 The title of EZCAP_QT will display the camera firmware version and the camera ID as shown below. 4. Before you click "connect", make sure you can see QHY90A in the device manager on Windows. Sometimes if you click "connect", you may see the warning shown in the picture below. That doesn't necessarily mean that the camera and your computer are not connected. In this case, you can just wait for a minute and click 'connect' again, then you can see it will be connected successfully. This is because it usually takes a while to load its firmware into your computer. 5. In Menu->Camera Setup, Click "Temp Control" and set the CCD sensor temperature. You can enable the "Auto Control" and set the target temperature. For example here we set the temperature to -10C. The CMOS temperature will come to -10C very fast (in about 2-3minute). If you want to close the TEC, you can select "TEC OFF". 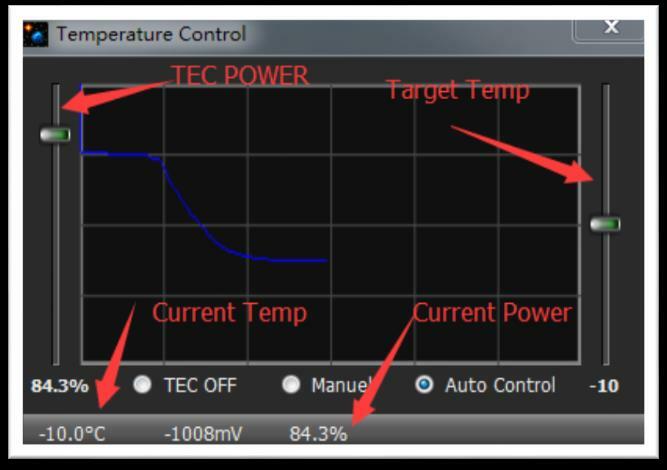 If you just want to set the TEC power but not the temperature. You can select "Manual" and then set the percent of the TEC power. 6. 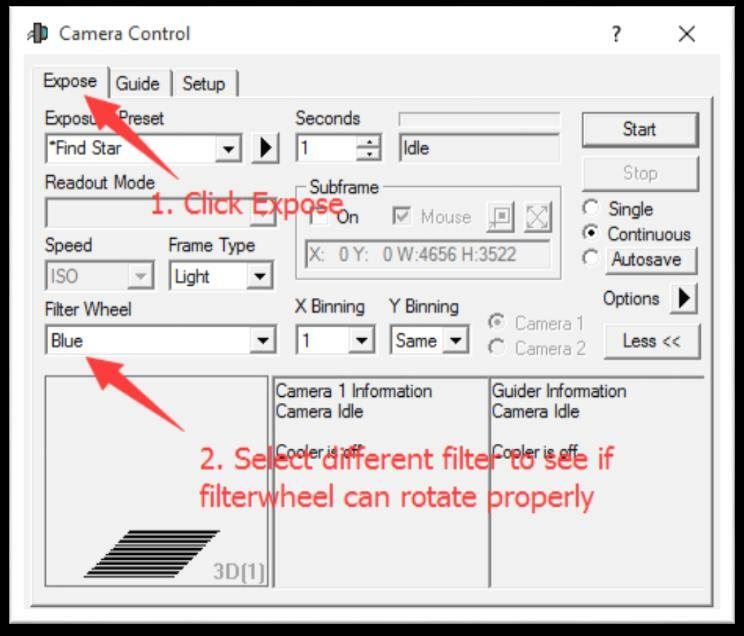 You can select which filter you are going to use by changing the position of filter wheel as shown in the following picture. 7. You can use the preview tab to do preview. And use the focus tools to do focus. Then use the capture tab to capture image. 8. In EZCAP_QT there is a planner for image tasking. You can capture a series images by using the table below. 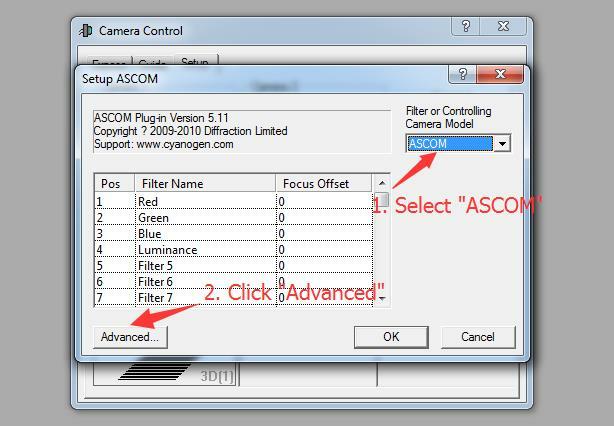 You can connect many software that support ASCOM. Currently QHY90A only supports normal ASCOM connection and does not support the ASCOM VIDEO connection. Please note that QHY90A always transfers maximum bit depth by ASCOM to make the best DSO imaging performance. The image format is 16bit width and patch zero on low bit. 1. 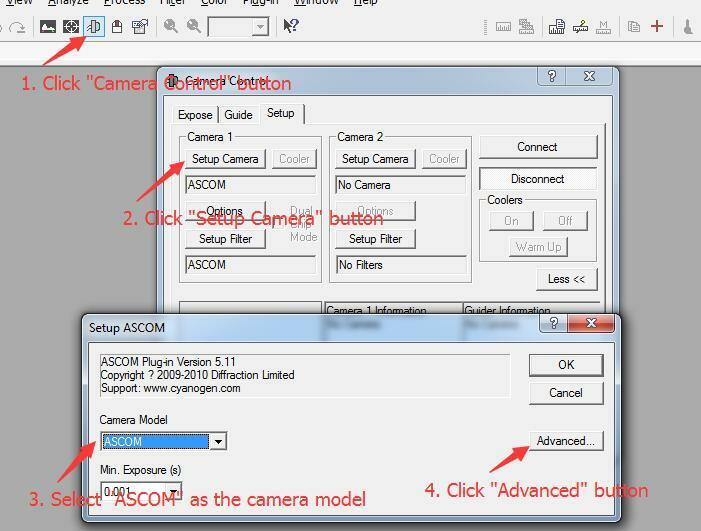 First you have to make sure that both ASCOM Platform and ASCOM driver have been installed. If not, please install it first. 4. 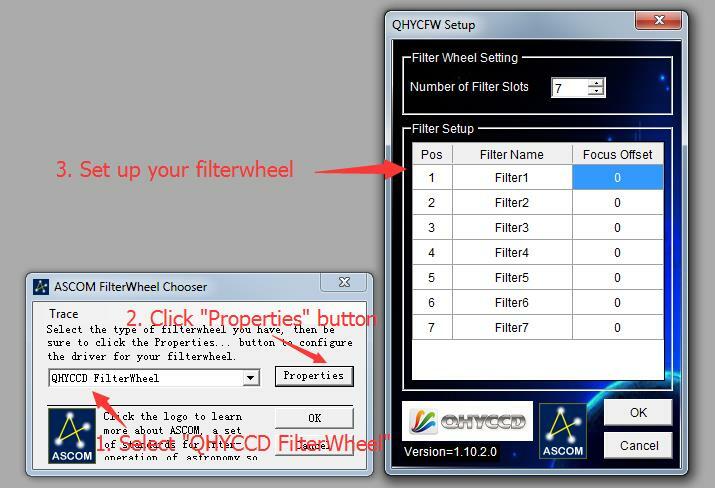 The following instructions are going to show you how to configure the built-in filter wheel in MAXIMDL. 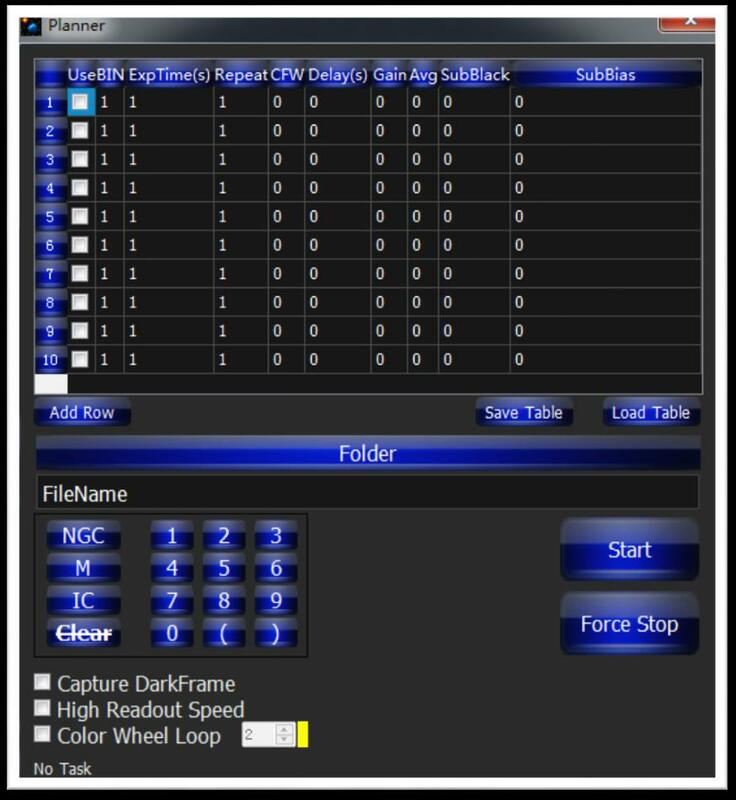 Sequence Generator Pro is an extremely powerful image capture suite. It can perform many complex tasks in order to meet your imaging needs. After you connect your gears and configure Sequence Generator Pro properly, you can go to sleep and see images in the morning. 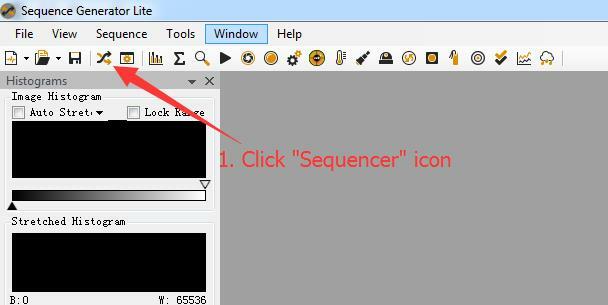 To use QHY90A in Sequence Generator Pro, you can follow the instructions listed below. 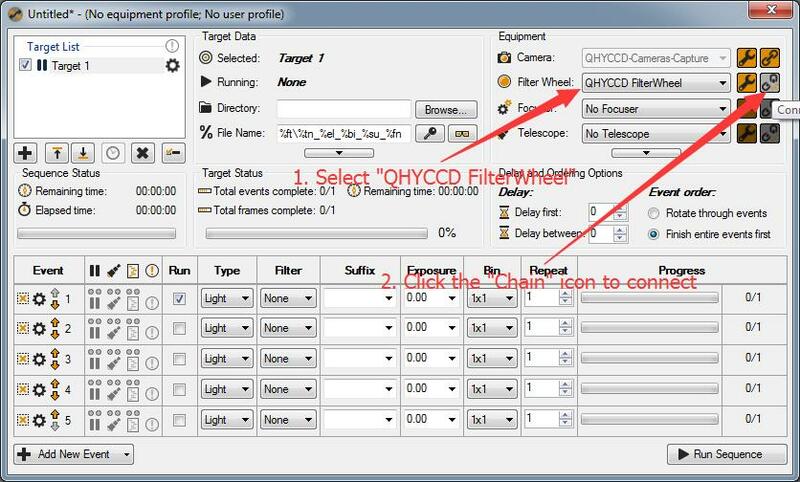 Note that before you select QHYCCD Filter wheel as the filter and click the red connect button, you should also make sure you've downloaded and installed the ASCOM Filters Plug for the built-in filter wheel, you've plugged in the 12V power supply cable, and the initialization of filter wheel has been finished. The latest FireCapture supports QHY90A already. Please go to FireCapture website to download its v2.5 BETA (32-bit) version. By default, it will be installed in the "Documents" folder. After it was installed successfully, navigate to "Document folder", and you will find its installation folder as shown below. Enter that folder and run "FireCapture.exe", then select QHYCCD camera. And after the loading, you will see the image on FireCapture like shown below. Note that the camera used in the picture above isn’t QHY90A, it is QHY16803A. They have the same peripheral ports. USB to Serial chip. These two serial ports provide standard RS232 signal level (±10V). You can use it to connect your camera to electric focuser and even equatorial mount. But note that this signal level is different from TTL signal level used in EQMOD. If you want to connect your camera to equatorial mount through EQMOD, A signal level convertor between TTL and RS232 is needed. After you finished installing the drivers, the serial ports drivers should also be installed. You can check its COM number in the device manager in the Windows so that you can use it in your application software. Serial port cable is optional accessory, and QHYCCD is developing many types of serial port cable. You can contact QHYCCD to know if there's serial port cable you need. The pin arrangement is already shown in the picture above. There are a trigger-in port (left) and trigger-out port (right). Trigger-in port is a pulse input port. The camera does not start exposure until it receives a pulse from its trigger-in port. Trigger-out port output a indicative signal during the exposure cycle. These two ports use optocoupler. 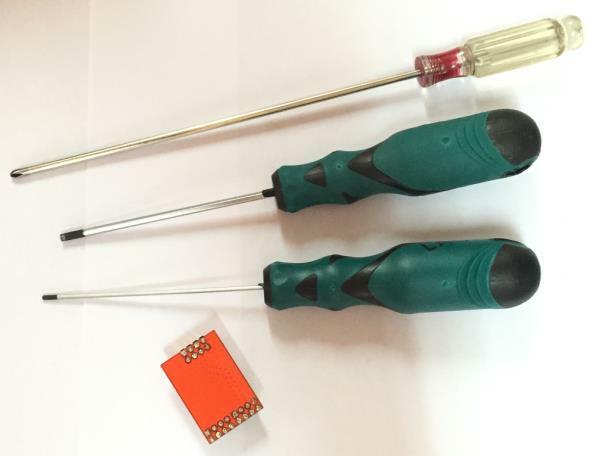 If you want to use these two ports, you can consult QHYCCD for detail method for electric connection. Keep the camera in good contact with the earth is the premise that the entire shooting system can work safely and properly. So QHY90A provides a grounding port. This port is connected to the GND on the PCB in the camera, and the GND is also the cathode of the 12V power supply. 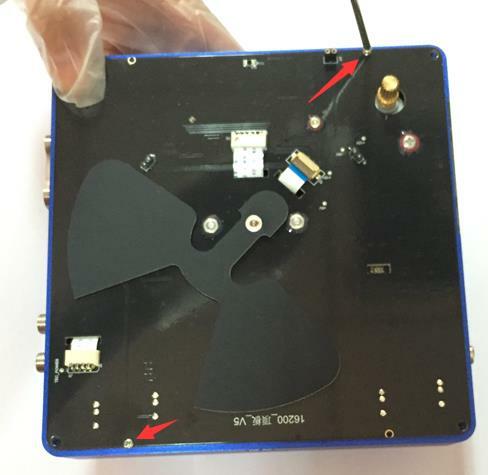 The grounding wire is included in the package, you can use it to connect the camera to other equipment (Metal case of the equatorial mount or metal case of PC) so that they have common ground. If you have no experience about it, please consult professional electrician. Caution: Never connect the grounding port to any electrical socket or outlet, otherwise, electrical shock may happen. These two ports are connected in parallel, so you can either one of these two as power input port and use the other one as a power output port for other devices that need 12V power supply. 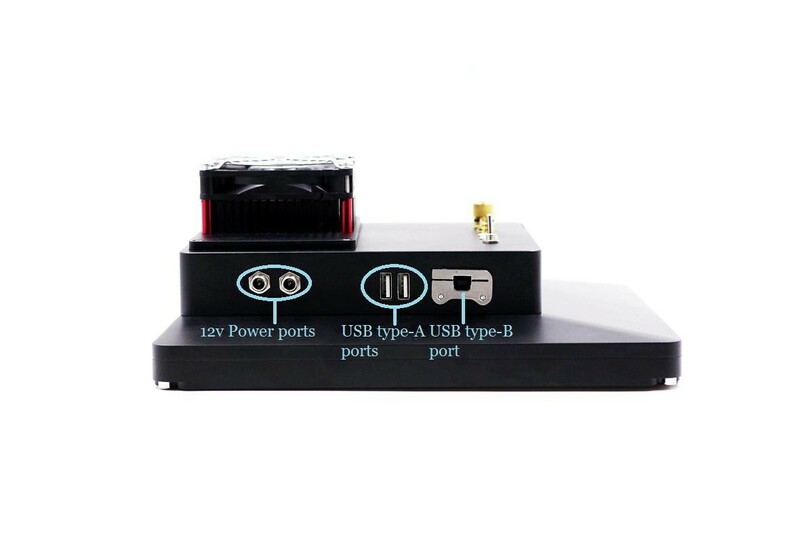 These two ports are USB expansion ports connected to the built-in USB hub, you can use it to connect with guide camera or other USB devices. This two ports can output 500 mA current. To reduce the power load of the internal circuit, it's recommended to reduce the use of current. QHY A series Cameras have a USB hub board in them. And these two USB type-A ports along with these two serial ports aforementioned are all branched out by the USB hub board. However, in some particular condition, it results in conflict and the camera will stop working. For example, in the condition where there equatorial mount you are using also has a built-in hub or where you used a USB hub already. In this case, you need to install the USB Hub bypass board (small red- colored board) included in the package. 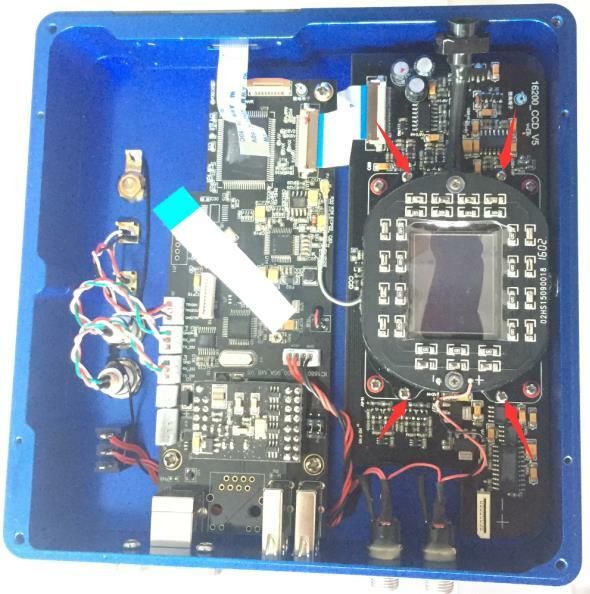 For detailed instruction of how to install the USB hub bypass board, please check the content in the following link. After you've installed that, those two USB type-A ports and those two serial ports become invalid. This port is used to connect the camera to the computer. The back focus length is 33mm. If it is used with QHYOAG-S and M42 adapter, the back focus length will be extended to 46mm. 2. How to clean the CCD sensor and the optic windows of the camera? Usually you can use flat fielding calibration to eliminate the shadow resulted from dust. It's not recommended to open the CCD chamber to clean the CCD on your own. Because if you do it in a place where there are still lots of dust, your effort may backfire. Besides, during the process of cleaning, you may scratch the CCD, and you may damage the internal circuit when you open the camera. QHYCCD provides CCD clean service. The cleaning fee is 100 USD per time and it doesn't include the shipping cost. If you really want to clean it on your own, you can follow the instructions below. Note that the camera used in instructions are QHY16200A not QHY90A, but they have similar structure. Follow the instruction carefully. You need to prepare the tools by yourself to open the camera. 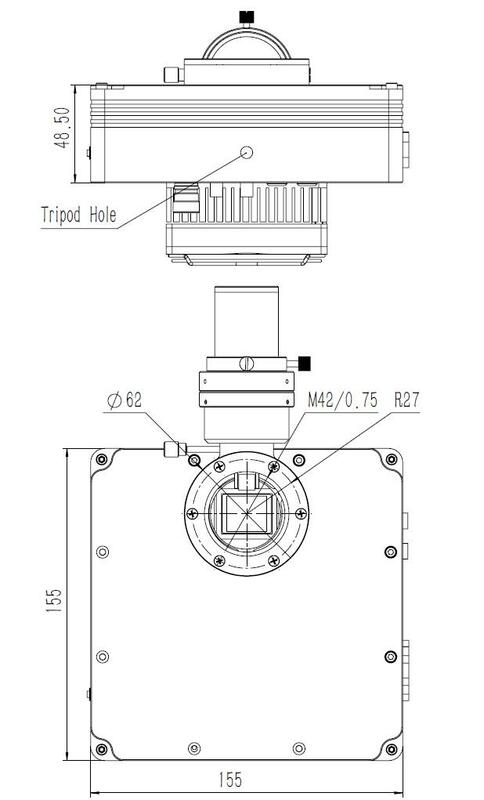 You will see two screws to fix the filter wheel case (the middle layer of the camera). Unscrew them. Remove the three cable carefully. 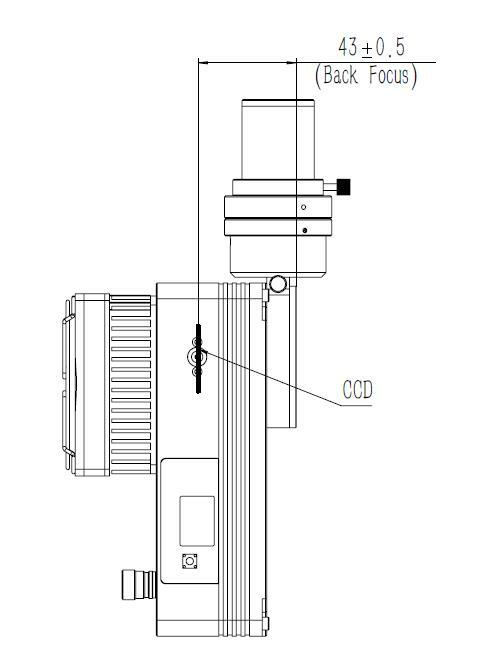 Please use a film to protect the CCD chamber optic window. screw for the silicone gel socket. Remove the four screw for the CCD chamber. There is totally eight screws for the CCD chamber. Only remove the four screws pointed by the red arrows in this picture. Now the CCD chamber is removed. The CCD sensor can be clean here. 3. 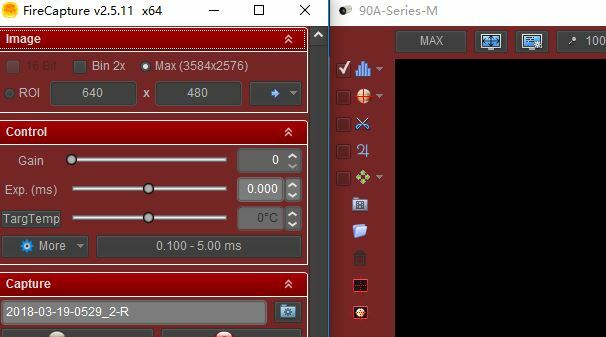 How to protect the cooler in QHY90A? The cooler in QHY90A can lower the CCD temperature to a value that's almost 40 degrees centigrade below the ambient temperature. So you need to be careful to avoid thermal shock, which refers to when the cooler's temperature rises or fall dramatically, the cooler is subjected to strong internal stress due to contraction principle. Drastic thermal shock can shorten cooler's service life or permanently break it. So when you begin to adjust the CCD temperature, you should avoid setting "Cooler Power" to its maximum value, and you should gradually turn up the "Cooler Power" value. When you turn off the power, if the "Cooler Power" value is very big, you should gradually turn it down before turn off the power. 4. What's small display on the camera for? The OLED display is used for display certain formation related to the shooting. It is directly driven by application program. So it may display different information or doesn't display anything at all based on different application programs. Currently all application program don't support this display, please wait for latest application program that supports this display. 5. What is defect columns? You may see one or more vertical columns whose top pixel is a bright dot. Normally speaking such columns are not defect column. 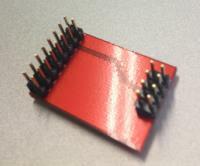 It is resulted from one pixel with high thermal current. All the pixels below that pixel will be affected by it as thermal current is transferred through that pixel. This pixel can be removed by dark frame calibration. If they cannot be eliminated entirely, you can solve this problem by using some astronomical image processing software. These software will replace that column with the average value of its surrounding columns. Aside from the columns we just talked about, you may see one or more black columns which is not full sensitive to the light or it is dim to light. This is the defect column and it cannot be removed by dark frame calibration. The following image shows a typical "defect" columns caused by a hot pixel, which is not very bright and it is usually not considered as a defect column. It will be gone after dark frame calibration. column. You have to use the some defect tools to remove it. 6. How to use the QHYOAG that the camera comes with? QHYOAG-S and a M42 adapter come with the QHY90A. By six M3 screws you can install them. The prism of the OAG may have a protect film on front surface. Please remove it before using. You can use QHY5L-II-M as the guider. 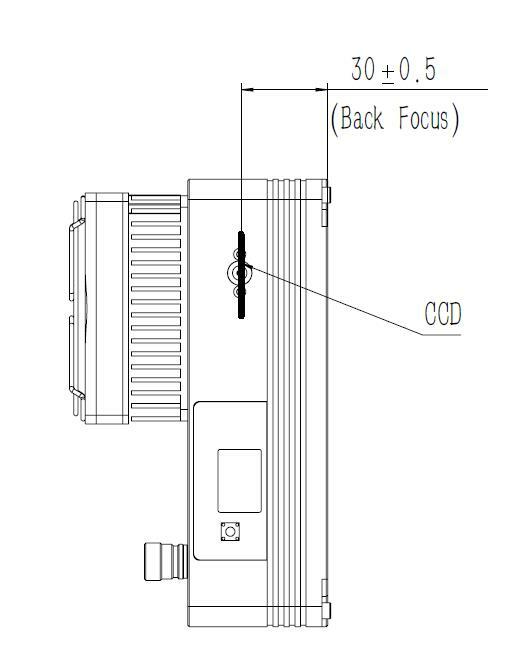 Please pay attention that you may remove the front part of QHY5L-II-M to get the back focus short enough for this combination of OAG-S and QHY90A. If you are using other guider. We are not guarantee the back focus is suitable for them due to the very short back focus of the QHY90A. 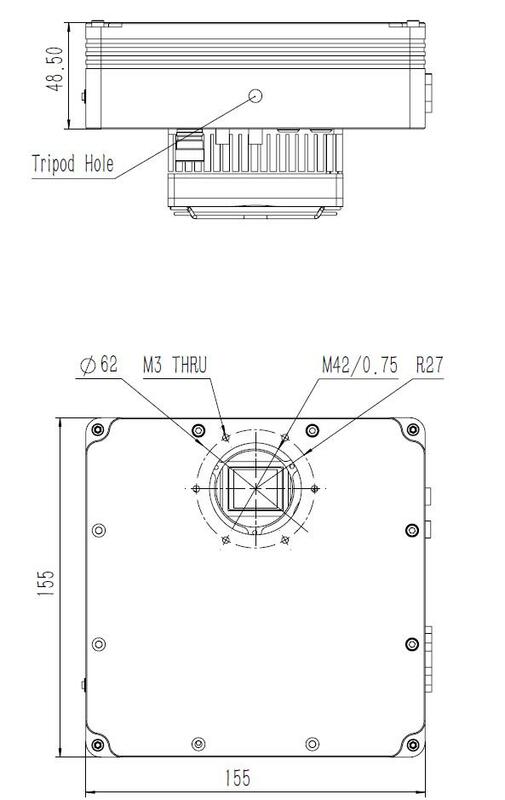 The thickness of QHYOAG-S is 10mm and the M42 adapter is 3mm. So the totally back focus addon is 13mm. The QHY90A back focus is 33mm. So the total back focus with QHYOAG-S is 46mm. 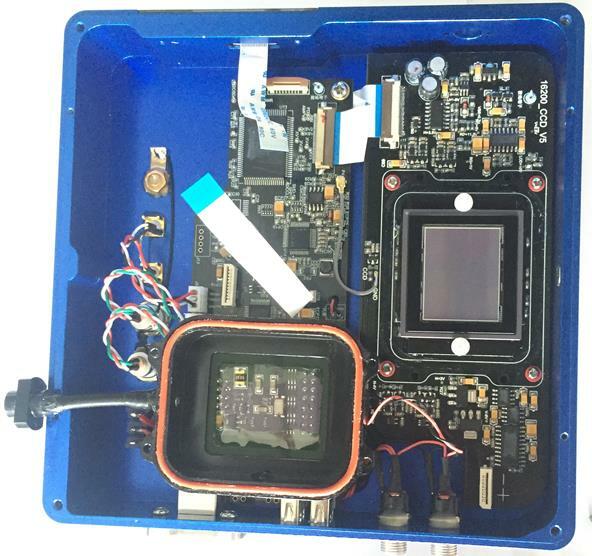 The CCD sensor is located in a CCD chamber. 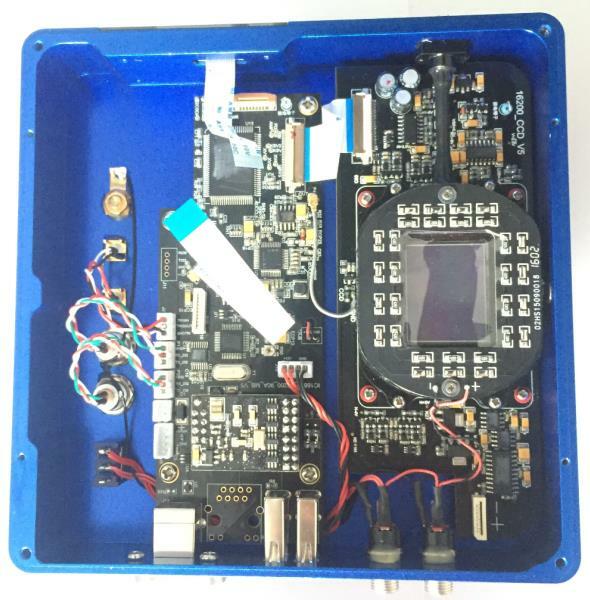 This chamber is airproof and connect to the socket of the silicone gel tube (drying tube) on one side of the case. If there is moisture and it causes the CCD sensor glass to get dew. You can use the silicone gel tube (drying tube) included in the package to dry it. Please put the effective silicone gel into the silicone gel tube. Make sure to put a small amount of cotton inside to prevent the silicone gel get into the CCD chamber. The process of drying usually needs 24 hours. 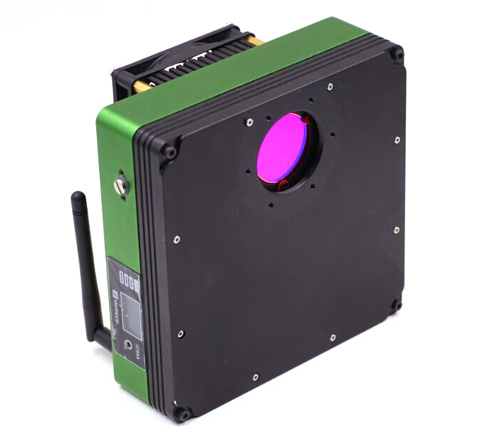 If the environment humidity is very high, the optic window of the CCD chamber may get dew. The QHY90A has the build-in heat board on this optic window to heat the optic window to avoid it. In most conditions it can take effect. If the optic window still get dew please try the following method. 2. Increase the temperature of the CCD sensor. You can increase the CCD sensor temperature a little to prevent the optic window get dew. 3. Check if the heat board is working. 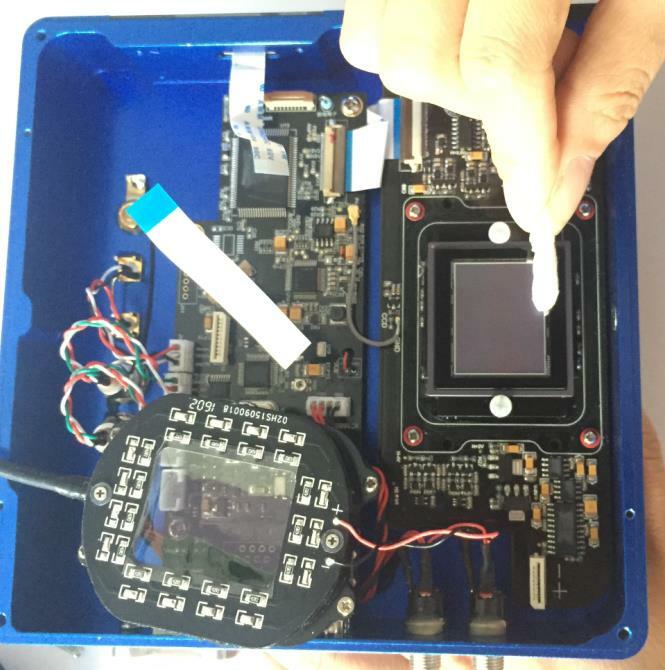 If the heat board is not working, the optic window easily get dew. Normally the heat board can get about 65-70C in +25C environment. 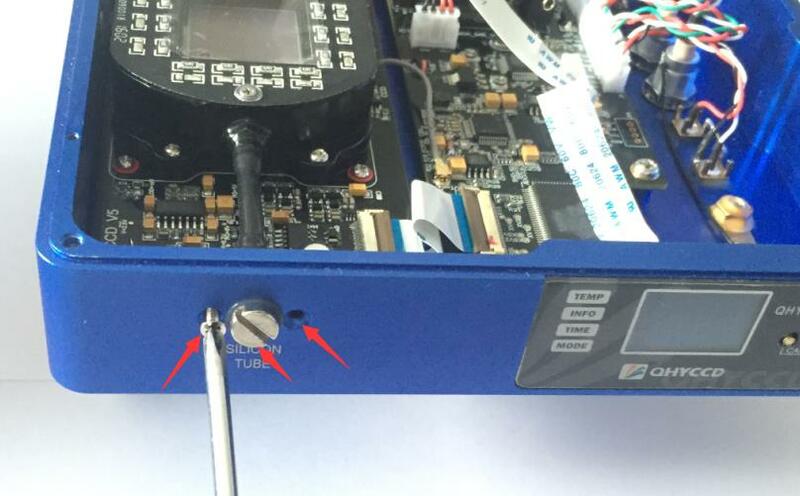 If it is not so warm, the problem can be the damaged heat board. You need to contact QHYCCD to replace one heat board.